My name is Paul Atkins, I am director of a family business that was formed in 1936, I began working for my grandfather, and still work with my father John Atkins. The business is called Atkins Photo Lab and is based in Kent Town, on the verge of Adelaide’s square mile and park lands. I am married to Kate Burns a highly talented graphic designer, and have two children Elizabeth and Josephine. I like boats. Big time. I just want to thank you for your blog. As you may know from the forum I am building a NIS 18 stretched a foot. At this point I am just a bit behind you, but as I am able to spend 20-24 hours per week, will soon be moving ahead. My wife just died recently which gives me added incentive to work on the boat to occupy my mind. Meanwhile your recent blog alerted me to be extra careful as I am also installing the chines and sheer strip. Your stem fitting by the way looks very nice. Mine is more sloppily done, which is okay because I don’t mind using a little more epoxy to make up for bad craftsmanship; nonetheless I appreciate good work when I see it. Thank you Dan, lovely to hear from you. I appreciate the kind words. Sorry for your loss, you have found a great distraction in boat building. I have read a great deal about the under-currents in boat building and what it can do for you. I have one really nice boat as a result of a break up. I am not a religious or mystical person, but I think launching a boat you made is a pretty ‘awesome’ experience. Robert Ayliffe was featured in Wooden Boat many years ago in a article entitled “Boat builder as Shaman” (WB issue #103, pg 64), it says it all. Keep in contact, I’d love to talk sometime. Hi Paul, glad to hear your going well on your NIS. After reading Klaus’s experiences in loading up the his 26’er with water and fuel for extended kimberly crusing and her bum draging as a result, I have rekindled an idea of installing water tanks to act as (partial) ballast and providing built in potable water storage. I just spent the last couple of months wrestlng out 2 x75kg lead ingots that I had epoxied into the boat (Ive gone for internal ballast within the rounded bottom section) and have now just received my two plastic water tanks that I will build and plumb together to hold approx 190ltr/kg of water. Gives me flexibility for ballasting/trim, drinking water and I can drop it at the ramp reducing 200kg off trailor weight. Just sharing a thought for when you get to that point. Hi Austin, great thoughts. I will definitely review the ballast water idea. Can you provide details on where and how you intend to flood and drain these? Thank you! Wow you are doing it the traditional way! Congratulations on your ingenuity. My name is Dan. I have a boat hire business in Sydney http://www.anyboat.com.au. A client asked today whether we had any self drive sailing boats similar to an NIS. To be perfectly honest I had no idea what he was talking about so did a Google search and found your site. After working in the boat hire / boat charter industry so long I was surprised to have never heard of such a boat. Obviously I am unfamiliar with these bots so do you know of anything similar? Have you heard of any NIS’ in Sydney? Or are they purely a niche Adelaide boat? 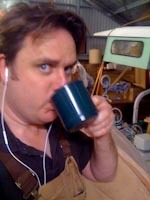 Hi Dan, you need to get in contact with Robert Ayliffe from StrayDogBoatWorks (http://nisboats.com/straydog/). He sells the kits and also has a wide understanding of what you are seeking. Best of luck! Thanks for the question. Hi Paul. Nice site and excellent craftsmanship. I’ve started a blog in the US about building inexpensive sailboats for novice builders. These designs are far less attractive and not nearly as seaworthy as yours, but they work. I hope to get people involved in boat building as a hobby. In the meantime, I’m getting familiar with the boat building community at large. If you’re curious about minimalist boatbuilding, I welcome you to take a peak. thank you for your comment! I did enjoy reading through your posts. I am sure you will drift to either boat design or building professionally designed boats. There are immutable rules that take a lifetime to realise are important, I love looking at great designs and reading why and how they work. Mike O’Brien of Wooden Boat has wonderful commentary on boat design. I got lost following that white rabbit for many years, I discovered the great traditionalists such as Herreshoff (all generations) and fell in love, then was challenged by Michael Storer, Ufa Fox and Phillip Bolger simultaneously, and was spat out at the feet of Bruce Kirby and Iain Oughtred. Boats are the ultimate design challenge, it is so incredibly academic and yet with centuries of local use some of the best designs arise.